There is nothing I like better than to sit down with a good horror story and let a writer try to scare me. I think horror is one of the more difficult genres to get right. It’s difficult to find an author who not only knows how to build tension to keep the reader hooked, but also sense when relief is needed from all the blood and gore so we don’t become desensitized. 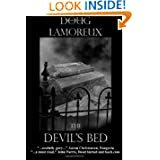 With that said, Doug Lamoreux’s The Devil’s Bed presented interesting characters, who were all shown as real people with both strengths and weaknesses. It was easy to suspend disbelief and imagine myself in their midst, sharing in their fear. The story begins with college student Brandy and her best friend Vicki taking a tour of a castle in France. Bored, Vicki allows herself to be led away from the group by one of the local boys. He ends up assaulting her on unhallowed ground by the graves of 14th Century Templar Knights who had been burned for witchcraft. When Brandy and the rest of the people on the tour can’t find Vicki, they are forced to leave without her. The boy who assaulted her is among those on the bus, but remains silent about what he’s done. When Vicki is knocked out, she hits her head on one of the crypts and her blood leaks inside where it is absorbed into the skeletal remains of the Templar Knight inside. Awakened from his long sleep, he rises and then uses Vicki’s blood to raise the others. They are all thirsty for blood and immediately begin their search for new victims. Brandy finds herself the leader of locals (including a priest) from a nearby town as they struggle to find a way to defeat the bloodthirsty Knights. They must band together if they want any hope of putting them back in their graves, permanently the second time. There are several great areas in the story that work to add depth, such as the demonized horses that rise with the Knights so they can ride again in search of victims. I loved it. An exciting, fun read for all those like me who crave a good scare. I know I’ll be watching for more novels in the near future by Doug Lemoreux. Posted by Denna Holm on September 22, 2012 in Archives and tagged 14th Century, devil worship, Horror, Templar Knights, vampires.